Nicotine is highly addictive and is primarily responsible for the maintenance of cigarette smoking. In 1994, Benowitz and Henningfield proposed the idea of federal regulation of the nicotine content of cigarettes such that the nicotine content of cigarettes would be reduced over time, resulting in lower intake of nicotine and a lower level of nicotine dependence. When nicotine levels get very low, cigarettes would be much less addictive. As a result, fewer young people who experiment with cigarettes would become addicted adult smokers and previously addicted smokers would find it easier to quit smoking when they attempt to do so. The regulatory authority to promulgate such a public health strategy was provided by the Family Smoking Prevention and Tobacco Control Act. Although it precludes ‘reducing nicotine to zero’, the act does not prohibit the Food and Drug Administration from setting standards for cigarette nicotine content that would prevent them from being capable of causing addiction. This paper reviews the assumptions implicit in a nicotine reduction strategy, examines the available data on the feasibility and safety of nicotine reduction, and discusses the public education, surveillance and support services that would be needed for the implementation of such a policy. Lowering the nicotine content of cigarettes is different from designing cigarettes that have low nicotine delivery as tested by cigarette smoking machines. The latter types of cigarette, once advertised as ‘low tar and nicotine’ or ‘light’ cigarettes, generate low yields in machine tests due to design features such as a faster rate of cigarette burn, increased ventilation and other factors, but do not involve reducing the nicotine content of the cigarette tobacco.2 ,7 Smokers of such purported low-yield cigarettes are easily able to compensate for these low-yield cigarettes by taking bigger and more frequent puffs, blocking the ventilation holes with their fingers or lips and/or smoking more cigarettes per day.2 ,7 Reduced nicotine content cigarettes can be designed similarly to regular cigarettes, except for the lower nicotine content. As the nicotine content is decreased in cigarette tobacco, it would be extremely difficult or impossible to absorb substantial levels of nicotine by smoking cigarettes more intensively (ie, by compensatory smoking8 ,9). A gradual reduction of nicotine levels of cigarettes was proposed by Benowitz and Henningfield in 1994.10 Whereas this proposal envisioned a reduction to non-addicting nicotine dosage levels over a decade or longer, recent research studies using reduced nicotine content cigarettes to aid smoking cessation have raised the possibility that more rapid lowering of nicotine content might be equally or more effective.11 A reduced nicotine cigarette policy would have to apply to all manufactured cigarettes and potentially to tobacco sold for roll-your-own cigarettes, small cigars and perhaps ultimately to all other combustible tobacco products in a particular country. One of the assumptions implicit in a nicotine reduction strategy is that there is a threshold nicotine exposure that is necessary to produce reinforcing effects and to sustain addiction. It is likely that there is no single threshold that applies to all people. There is considerable individual variability in dose sensitivity to all drugs, including nicotine. The key questions is: what level of nicotine reduction is required to prevent novice smokers from becoming addicted and to help established smokers to be readily able to control their use of cigarettes—that is, to quit smoking more easily when they decide to do so? Sofuoglu and LeSage reviewed the question of nicotine addiction threshold as a target for tobacco control.15 They noted the challenges of determining daily addiction thresholds and suggested that the threshold for nicotine regulation should be based on the amount of nicotine per unit dose (eg, per puff from a cigarette) that produces reinforcement—the ‘nicotine reinforcement threshold’. There are undoubtedly many other tests that may be employed to determine the maximum allowable level of nicotine per cigarette, just as many methods are used to comprehensively assess the addictiveness of drug products.16–18 Regardless of which methods are used, the standards for cigarette design, including nicotine content, need to ensure that no populations of concern (including children) would derive reinforcing effects from cigarette smoking or be readily capable of obtaining sufficient nicotine to produce addiction. Furthermore, it will be important that the policy be implemented with sufficient flexibility to further reduce the allowable nicotine level if surveillance and relevant biomarkers indicated that reinforcement and addiction continued to occur. One of the concerns in reducing the nicotine content of cigarettes is that smokers would smoke more cigarettes per day and/or smoke cigarettes more intensively, thereby increasing their exposure to harmful tobacco smoke toxicants. It is well known that smokers adjust their smoking behaviour when switched from regular to light cigarettes so as to maintain their desired level of nicotine intake.2 ,7 Increased exposure to tobacco toxicants could result in increased health risks. Research on reduced nicotine content cigarettes suggests that smokers do not take in more smoke when the level of nicotine is lowered. Benowitz et al19 conducted a 6-week longitudinal study of 20 smokers who were not planning to quit smoking in the next 6 months. These smokers smoked their usual brand and then five different cigarettes with progressively lower nicotine contents (ranging from 10 mg down to 0.6 mg per cigarette), each for 1 week. The intake of nicotine, estimated by plasma cotinine, declined progressively as the nicotine content of the cigarette declined (figure 1). The number of cigarettes smoked per day (figure 2), as well as expired carbon monoxide and urinary polycyclic aromatic hydrocarbon metabolite excretion, did not change significantly, while the level of urine 4-(methylnitrosamino)-1-(3-pyridyl)-1-butanol (a marker of tobacco-specific nitrosamine exposure) decreased. 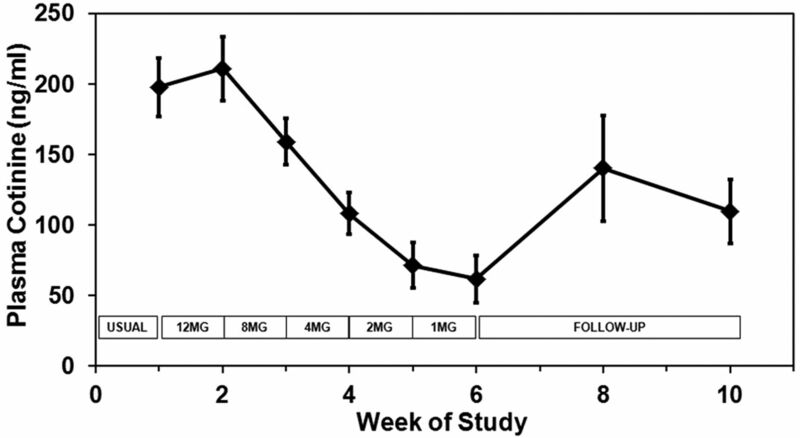 Plasma cotinine concentration over the weeks of the study during progressive reduction of the nicotine content of cigarettes (weeks 1–6) and after returning to usual cigarettes or quitting (weeks 7–10).19 The bars represent the SEM. Data points represent mean values for 20 subjects. The second study used a similar design, but with a larger number of subjects smoking cigarettes with reducing nicotine content (N=53) and included a control group of people smoking their usual brand of cigarettes (N=50).20 In this study, the nicotine content of the cigarettes was tapered on a monthly rather than a weekly basis. Monthly tapering would allow more time to adapt to lower levels of nicotine intake and could lead to greater smoker acceptability. The results of the second study were similar to the first study, showing a progressive decline in nicotine intake, with no significant change in cigarettes per day or toxicant exposure. In both studies, some smokers quit smoking spontaneously, and those who continued to smoke reported a lower level of dependence. 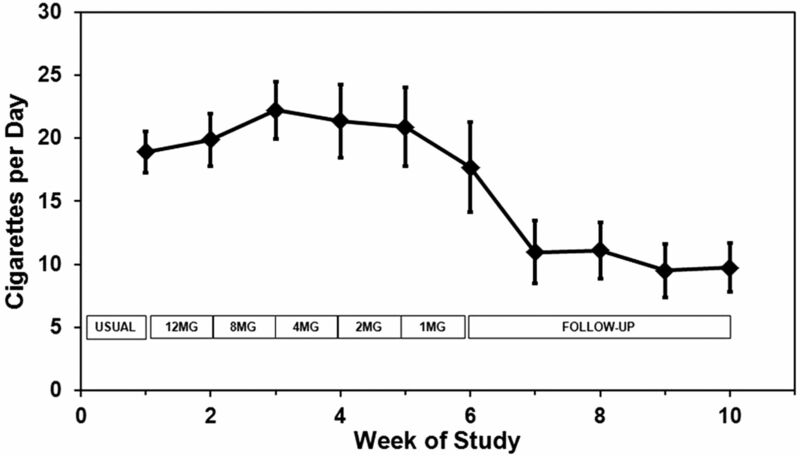 Hatsukami conducted a study of reduced nicotine content cigarettes in smokers who were interested in quitting.11 Treatments included switching smokers abruptly from their own cigarettes to reduced nicotine content cigarettes or nicotine lozenges with a nicotine yield of 0.05 mg or 0.3 mg, which were provided for 6 weeks. The 0.05 mg delivery cigarette groups did not increase their cigarette consumption but did reduce their exposure to nicotine and 4-(methylnitrosamino)-1-(3-pyridyl)-1-butanol and had higher rates of cessation compared to the 0.3 mg nicotine delivery group. This study suggests that the nicotine content of cigarettes might be able to be reduced quickly rather than gradually over years. Evaluations of the nicotine reduction approach since the original proposal have concurred that it should only be implemented in the context of a national comprehensive tobacco control programme (eg, refs. 8 ,14 and 23) Such a programme would include public education to prepare smokers for the nicotine reduction strategy, provision of treatment and alternate nicotine delivery systems for those who may need such support, and implementing a surveillance system that could quickly detect potential unintended consequences so as to enable appropriate interventions and modifications of the strategy.8 ,14 The Workshop on Endgame Strategies in Tobacco Control provided additional support for these conclusions and for the conclusion that the approach appears more compelling today in light of the projections that on its current course, the global tobacco death toll will continue to rise for decades to come. Since the initial proposal, new products that could arguably be regulated either as tobacco or nicotine and which appear to contain substantially fewer toxicants than traditional tobacco products have been marketed. These include ‘tobacco’ lozenges, dissolving strips, sticks or pouches, and cigarette-like devices that deliver nicotine without products of combustion. Such products and NRT products may provide the support that is at least temporarily needed for some smokers to give up cigarettes entirely and to manage a world in which nicotine use by burning tobacco is less available. An additional regulatory approach that could be incorporated into a nicotine reduction policy is differential taxation, such that taxes on combusted tobacco products are much higher than those on cleaner nicotine delivery products. Public health policy is premised on a clear understanding by the public as to what is intended and why it is important (eg, washing hands to reduce the spread of influenza). A nicotine reduction policy would require extensive education of tobacco users, their friends and relatives, and health professionals to prepare them for the process and guide them along the way so as to minimise unintended consequences and improve the outcome. A nicotine reduction policy will be very likely to increase tobacco cessation efforts in anticipation of the policy and as it is implemented. As discussed in the 1998 report, it would be important to increase access to treatment for tobacco dependence and withdrawal, including behavioural counselling, smoking cessation medications and broad coverage by insurance programmes.14 This should include individualised services for special populations such as people with co-morbid psychiatric disorders who may warrant extra assistance. There is a possibility that decreased access to the forms of tobacco that addicted users most want, namely nicotine-containing cigarettes, will increase the demand for contraband cigarettes. Even if this occurred, it is difficult to envision that such a massive scale of contraband could emerge so as to rival the present pipeline of cigarettes that, for example, numbers more than 1 billion per day in the USA, delivered to tens of thousands of retail outlets. The greatest antidote to mass contraband is likely to be a combination of increased access to treatment and alternative products (including the aforementioned ‘grey’ area of tobacco/nicotine products) and education. In the 1994 proposal to reduce nicotine in cigarettes to non-addictive levels, we concluded our paper as follows: ‘The measures described in this proposal may seem drastic to some. However, the problem of one quarter billion premature deaths caused by tobacco use in developed countries call for drastic action’.10 Nearly two decades later, despite enormous progress in tobacco control efforts, the trajectory of tobacco-caused premature death and disease continues to rise globally. Furthermore, progress is unacceptably slow towards the goal articulated by former Surgeon General C. Everett Koop to end the 21st century as we ended the 19th century with ‘lung cancer… relegated to the status of a rare disease’.29 On the other hand, the technical, social, medical and regulatory feasibility of a nicotine reduction approach has increased with the progress of science, establishment of a global treaty on tobacco control and regulatory authority by agencies such as the US FDA, as discussed in this paper and elsewhere.8 ,9 ,14 Preventing children from become addicted smokers and giving people greater freedom to stop smoking when they so decide to quit by reducing the addictiveness of cigarettes is a policy that increasingly appears to be feasible and warranted. Department of Health and Human Services PHS. Preventing tobacco use among young people. A report of the Surgeon General. Washington, DC: US Government Printing Office; 1994. Department of Health and Human Services PHS. How tobacco causes disease: the biology and behavioral basis for smoking-attributable disease. A report of the Surgeon General. Washington, DC: US Government Printing Office, 2010. Framework Convention on Tobacco Control. Protocol to Eliminate Illicit Trade in Tobacco Products opened for signature. http://www.who.int/fctc/en/ (accessed 2 Jan 2013). British American Tobacco Company. RDW. Complexity of the PA 5A machine and variables pool. Minnesota Trial Exhibit 10,392. State of Minnesota et al v. Phlip Morris, Incl, et al. (1959).
. Reducing tobacco addiction through tobacco product regulation. Tob Control 2004;13:132–5. National Cancer Institute. Risks associated with smoking cigarettes with low machine-measured yields of tar and nicotine. NIH Publication No. 02–5074. Bethesda, MD: U.S. Department of Health and Human Services, National Institutes of Health, National Cancer Institute, 2001.
. Establishing a nicotine threshold for addiction. The implications for tobacco regulation. N Engl J Med 1994;331:123–5.
. Reduced nicotine content cigarettes: effects on toxicant exposure, dependence and cessation. Addiction 2010;105:343–55. US Government. Family Smoking Prevention and Tobacco Control Act. Public Law # 111–31 2009. http://frwebgate.access.gpo.gov/cgi-bin/getdoc.cgi?dbname=111_cong_public_laws&docid=f:publ031.111.pdf (accessed 27 Sep 2012).
. Biomarkers of cigarette smoking. In: Shopland DR, Wilkenfeld J, Henningfield J, Eriksen MP, Modell SD, eds. The FTC cigarette test method for determining tar, nicotine and carbon monoxide yields for US cigarettes NCI smoking and tobacco control Monograph No 7. NIH Publication No. 96-4028. Bethesda, MD: US National Institutes of Health, National Cancer Institute, 1996:93–111.
. Reducing the addictiveness of cigarettes. Council on Scientific Affairs, American Medical Association. Tob Control 1998;7:281–93.
. U.S. Department of Health and Human Services. The reinforcement threshold for nicotine as a target for tobacco control. Drug Alcohol Depend 2012;125:1–7. U.S. Department of Health and Human Services. Draft guidance for industry: assessment of abuse potential of drugs. 2010. http://www.fda.gov/downloads/Drugs/GuidanceComplianceRegulatoryInformation/Guidances/UCM198650.pdf (accessed 27 Sep 2012).
. Principles of laboratory assessment of drug abuse liability and implications for clinical development. Drug Alcohol Depend 2009;105(Suppl 1):S14–25.
. Abuse liability assessment of tobacco products including potential reduced exposure products. Cancer Epidemiol Biomarkers Prev 2009;18:3241–62.
. Nicotine and carcinogen exposure with smoking of progressively reduced nicotine content cigarette. Cancer Epidemiol Biomarkers Prev 2007;16:2479–85.
. Smoking behavior and exposure to tobacco toxicants during 6 months of smoking progressively reduced nicotine content cigarettes. Cancer Epidemiol Biomarkers Prev 2012;21:761–9.
. Effects of low nicotine content cigarettes on smoke intake. Nicotine Tob Res 2004;6:309–19.
. Smoking in the absence of nicotine: behavioral, subjective and physiological effects over 11 days. Addiction 2007;102:324–34. , ed. Nicotine safety and toxicity. New York: Oxford University Press, 1998.
. The emerging market for long-term nicotine maintenance. JAMA 1997;278:1087–92.
. Treatment of tobacco dependence: innovative regulatory approaches to reduce death and disease: preface. Food Drug Law J 1998;53(Suppl):1–8.
. Tobacco product regulation: context and issues. Food Drug Law J 1998;53(Suppl):43–74.
. Tobacco-dependence medications: public health and regulatory issues. Food Drug Law J 1998;53(Suppl):75–114.
. Preface. In: Boyle P, Gray N, Henningfield J, Seffrin J, Zatonski W, eds. Tobacco and public health: science and policy. 2nd edn. Oxford: Oxford University Press, 2010:v-xvii. Contributors All authors of this research paper have directly participated in the planning, execution or analysis of the study. All authors have read the final version and conflict of interest statement, and approved and approved submission for publication. Funding Research on reduced nicotine cigarettes cited in this paper was supported by US Public Health Service Grant CA78603 from the National Cancer Institute and the General Clinical Research Center at San Francisco General Hospital with support of NIH/NCRR CTSI grant R024131.